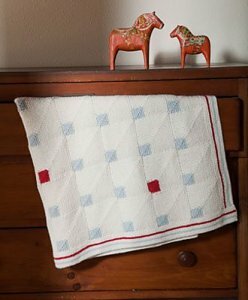 Taken from Interweave Knits Magazine - '12 Holiday Gifts: "The Dots Blanket can be modified to any size or to use any combination of colors. The squares are picked up and knit from each other - no sewing involved!" This pattern is in Interweave Knits Magazine - '12 Holiday Gifts, page 40. Size US 6 needles and US 6-47" circulars (or sizes required to obtain gauge) are required but not included. Finished Measurements: 32 (40, 48, 56)" wide and 40 (40, 60, 72)" long. Cubics Single Point Needles - US 6 (4.0mm) - 14"
$99.00 -- Kit price including yarn only (no book or pattern). $121.00 -- Kit price including yarn only (no book or pattern). $187.00 -- Kit price including yarn only (no book or pattern). $275.00 -- Kit price including yarn only (no book or pattern).